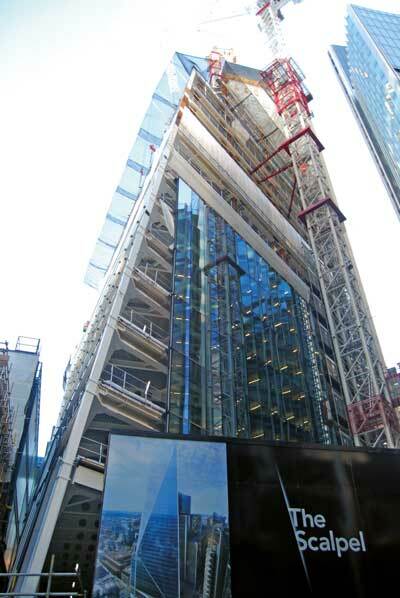 Eventually reaching a height of 190m, 52 Lime Street is the City of London’s latest standout commercial development. Martin Cooper reports. Steel tonnage: 10,500tFeaturing a dramatic architectural shape with asymmetric facets and a pointed attic roof structure, 52 Lime Street has from its inception been dubbed the Scalpel, a name that has since been adopted as the official moniker. 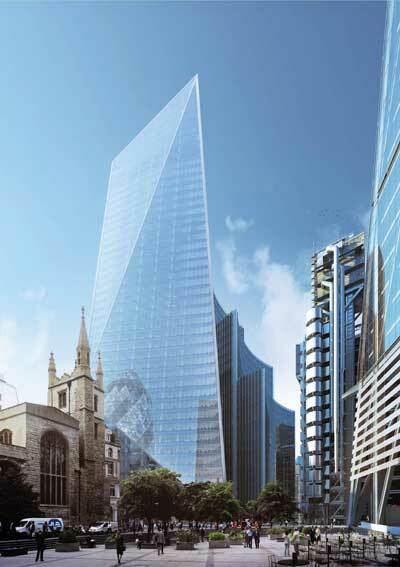 Joining a cluster of other prestigious high-rise buildings in the square mile, the project will offer 36,966m² of internal floor area over 35 office floors, retail and restaurant areas. Designed by architects Kohn Pedersen Fox, the project also includes a public square. The realm may also provide space for public art and tables linked to a specialist ground floor coffee shop, designed as a nod to the 17th century establishments that acted as meeting houses for London’s fledgling insurance market. Setting it apart from its neighbours, the Scalpel features an inclined northern façade, which has a diagonal fold line running from top to bottom giving the building its distinctive look and name. This façade is formed with a series of cranked plate girder columns, spaced at 6m centres. For the double-height ground floor these columns are vertical, but from the first floor they are cranked and slope inwards all the way to the building’s pointed top. Elsewhere, the structural frame consists of a composite design with steelwork supporting metal decking and a concrete slab. All of the floor beams are 670mm-deep fabricated plate girders with holes in the web to allow service integration within the structural floor zone. 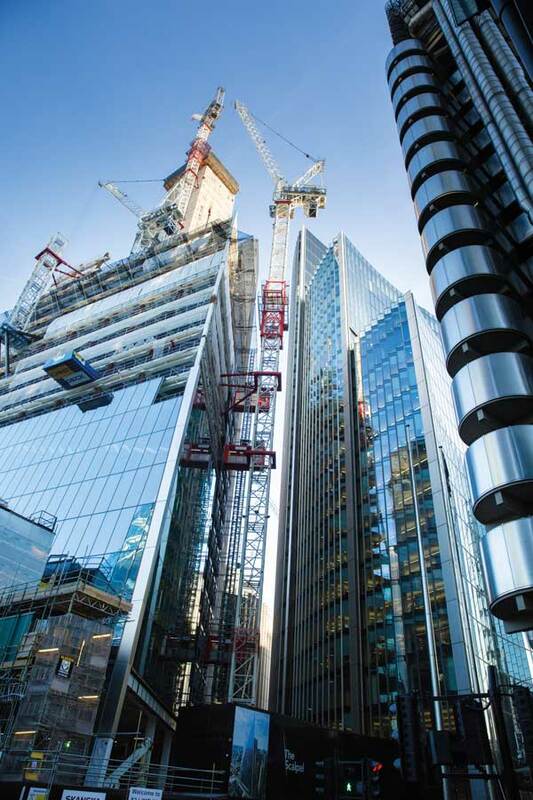 Cost also plays an important role in any construction project and the use of a BIM model on this scheme has helped the team ensure the steelwork frame is as efficient as possible. 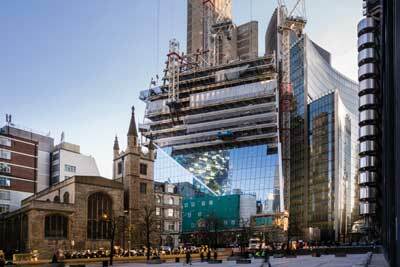 Scheduled for a late 2017 completion, main contractor Skanska is well on with its 160-week construction programme. Having taken possession of the site once the demolition of the previous building to ground floor level had been completed, Skanska’s initial task was to complete the basement works prior to the steelwork erection starting. A third of the existing basement was partially deepened and, to keep the construction programme on schedule, the ground floor slab was cast early. This allowed the basement construction to be done in a top-down method, while the steel erection was able to carry on above simultaneously. Early works also included constructing the building’s main concrete core. 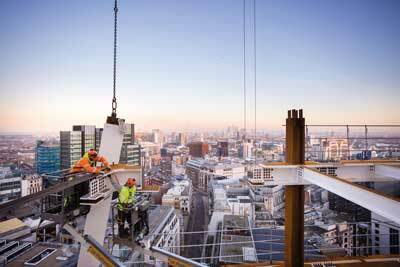 Once this had reached its halfway point at level 17, the steel erection programme was kicking off at ground floor. Unlike many commercial buildings, the Scalpel’s main core is offset and positioned along the south elevation, which provides shade from solar gain. In this way, the structure’s available floor space has been maximised and internal spans of up to 20m have been achieved. Having an offset core coupled with an inclined north elevation means that the loads on the building are eccentric from the main stability-giving core. To counteract this, the north elevation, as well as the east and west facades, have been designed as large perimeter moment frames to add stiffness to the building. The core houses three banks of lifts, one for the lower levels (1 to 12), one for the mid-levels (13 to 24), and one for the upper levels (25 to 35). This means the core decreases in size towards the top as only one bank of lifts is accommodated at the upper levels. Again, this has helped the project further maximise the available floor space. Because of the building’s inclined northern elevation, floor areas decrease from 1,466m² on the second floor to 614m² on level 35, the uppermost office floor. Up to level 21 the building has one row of internal columns, but as the floorplates decrease these are no longer needed and by level 24 there are none. Topping the building is a 10-storey triangular attic that will house plant and maintenance walkways. A high piece count would have ordinarily been expected for this structure so, in order to make the erection process as easy as possible and iron-out any snags, William Hare will trial erect this portion of the building at its fabrication yard. “Once it has been trial erected the attic structure will be dismantled and then brought to site in the largest pieces that can be transported and erected by the on-site tower cranes,” explains Mr Perry. The attic is a complex steel structure designed to be erected floor level by floor level, with each level immediately stable upon erection. Designing the attic in this way was vital as there is no core this high up the building to give stability and no internal floors to provide any diaphragm action. The steelwork programme is due to be completed in the summer and the Scalpel will be handed over at the end of the year. Because of the building’s triangular-like shape and the prevailing south-westerly winds that will hit the structure’s narrowest point, a total of seven viscous dampers have been installed within the north elevation steelwork. Viscous dampers are hydraulic devices that dissipate the kinetic energy of the building and stop the build-up of uncomfortable side to side accelerations in a wind storm. Because they are built into the stability system of the building they provide damping at a fraction of the cost and take up less space than the more traditional “Tuned Mass Damper” or TMD.